Microplastic is in our water supply. 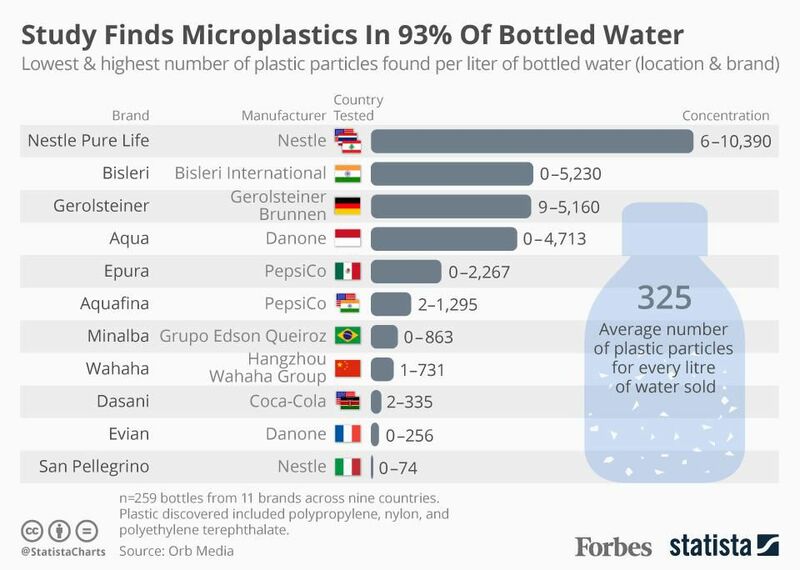 The World Health Organisation (WHO) in 2018 announced a review into the potential risks of plastic in drinking water after a new analysis of some of the world’s most popular bottled water brands found that more than 90% contained tiny pieces of plastic as you can see in the infographic below. Sticking to tap water won't keep you away from microplastics. Scientists in 2018 found microplastic in tap water around the world. If you want to joke you'll drink beer instead of water, microplastics are in beer too. 2 years ago research found young fish eat plastic like kids eat junk food. If microplastics are in the Earth's water supply it's not just marine life that can be affected. A decade of research including this study has found that the muscles and eggs of birds in the far-flung Aleutian Islands, a remote area of Alaska, contain endocrine-disrupting phthalates from plastics the animals have ingested, prompting Alaskan tribes to begin testing native foods for contamination. According to WHO officials, there is no evidence that the consumption of microplastic fibers has an impact on human health, but it remains an emerging area of concern. However contrary to that view, researchers have identified early childhood health impacts including speech and language developmental delays from prenatal exposures to phthalates found in plastic. The article published in the Journal of the American Medical Association Pediatrics is from the work of researchers in Sweden as well as the United States, including Rutgers University’s School of Public Health and the Icahn School of Medicine at Mount Sinai in New York City. While prior research raised concerns about the substances’ impact on child neurodevelopment and other health issues, the companion Swedish and American studies are believed to shed new light on the chemicals’ potential for adverse impacts on early childhood speech development. The studies involved nearly 965 Swedish expectant mothers and 370 U.S. mothers-to-be who gave urine samples during the first trimester of pregnancy. The samples were tested for phthalates, a family of substances used to make plastics more flexible and durable, which are known to enter the environment and can be found in the air, food, and water. Phthalates can also be detected in blood, breast milk and even amniotic fluid. When the U.S. children in the study were about 37 months old and the Swedish children were about 30 months old, their mothers were asked how many words their offspring used. Use of less than 50 words was considered a language delay. Both studies found that about 10 percent of the children used 50 words or fewer, and nearly 3 percent understood fewer than 25 words. Two types of phthalates, dibutyl phthalate and butyl benzyl phthalate, were particularly linked to the verbal delays. Levels of two types of phthalates were found in higher concentrations in those mothers. Get a whole house water filter. One I found on this list, Home Master, for example, is a whole house water filter for under $400 dollars at Home Depot. Check around and find one that seems best for your situation as there are numerous other options. More importantly, let's work together to recycle and find a solution for the plastic in our environment. Here's a creative and successful idea on how to solve the plastic problem along with poverty at the same time -by turning plastic into currency! Lisa Geng got her start as a designer, patented inventor, and creator in the fashion, toy, and film industries, but after the early diagnosis of her young children, he entered the world of nonprofit, pilot studies, and advocacy. As the mother of two “late talkers,” she is the founder and president of the nonprofit CHERAB Foundation, co-author of the acclaimed book, The Late Talker, (St Martin’s Press 2003), and is instrumental in the development of IQed, a patented nutritional composition. Lisa currently serves as a parent advocate on an AAN board for vaccines and is a member of CUE through Cochrane US. Lisa is currently working on a second book, The Late Talker Grows Up and serves as a Late Talkers, Silent Voices executive producer. She lives on the Treasure Coast of Florida.